Next year three parks will be celebrating their 50th year in the system: Biscayne in Florida, Redwood in California and North Cascades in Washington. And one park will be celebrating its 100th: Katmai in Alaska. We are leading night workshops in both Biscayne and Redwood, and the culminating photography that comes out of those workshops from both the participants and the instructors will be featured in two concurrent group exhibits at both parks! The show is tentatively titled “From the Redwood Forest to the Gulf Stream Waters.” How cool is that? Whether you join us for a workshop, attend one of the exhibits or want to just venture out on your own, we highly recommend witnessing and helping to celebrate the historic milestones of these great national parks. For more about each place, what they’re planning for their anniversaries, and how we’re planning to participate, see the information below. One of the things that makes Biscayne so unique is that 95 percent of its 172,924 acres are under water. It is truly a wonderful water world. Stiltsville—orange house along the forever horizon in Biscayne National Park. © 2017 Tim Cooper. The rangers and the community around Biscayne have been so welcoming and incredible to partner with. They kicked off their golden anniversary in October and will be hosting many events over the next 14 months. National Parks at Night is honored and thrilled to be part of the celebrations with a group show of our Biscayne students’ work in October 2018. We specifically planned our workshop during the first major celestial event in 2018: a blue supermoon! With spectacular horizon lines surrounding all aspects of Biscayne, we are all but guaranteed to capture the supermoon as it rises and reflects over the horizon. 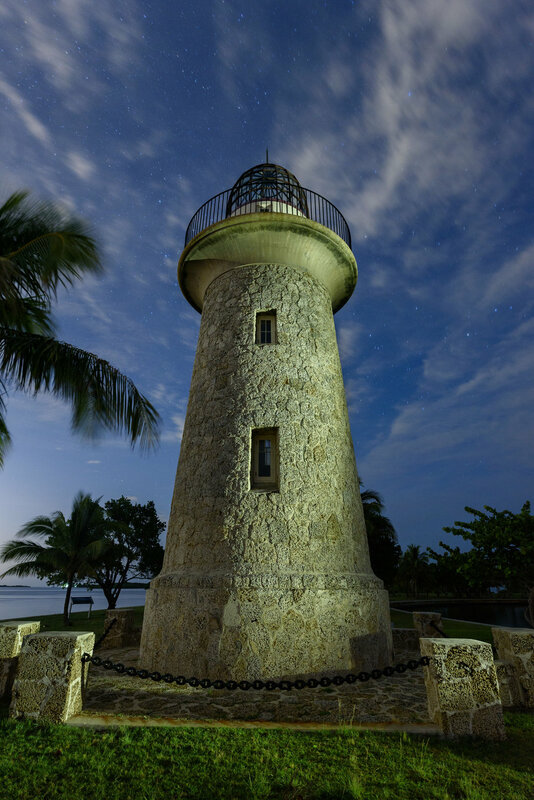 Boca Chita Lighthouse will be just one of our many explorations at Biscayne … at night!. © 2017 Gabriel Biderman. Out of all the National Parks, Biscayne might be one of the least documented at night, because there are very few places to set down your tripod on terra firma! However, we are getting special access to one of the surreal floating houses of Stiltsville, access to the ornamental lighthouse on Boca Chita, as well as access to several of the keys that never have nocturnal visitors! So come and be one of the first groups to lead a night photography venture in Biscayne! The far north of the California coast makes for one of the more unique settings of any of the national parks. In addition to the truly amazing redwood forests, the park includes upland prairies which overlook the fog-shrouded tall trees below, and miles of spectacular Pacific Ocean coastline dotted with jagged sea stacks. 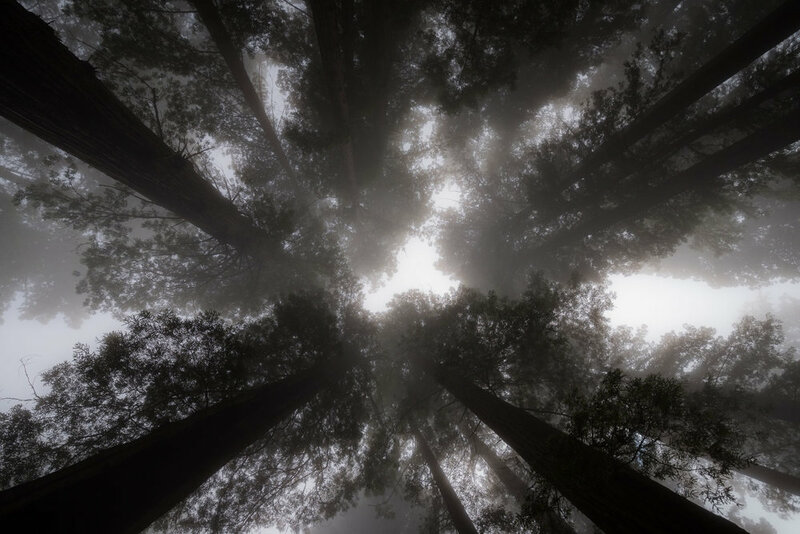 Fog-shrouded coastal redwoods in the Lady Bird Johnson grove. © 2017 Lance Keimig. Redwood National and State Parks is a unique conglomeration of three California state parks and the national park, which was approved by Congress and signed into law by President Johnson in 1968. Conservation of the California coastal redwoods dates back even further—in fact, much further. The Save the Redwoods League was formed in an effort to protect remaining redwood forests from logging, and was instrumental in the founding of the three state parks. Today, the California Department of Parks and Recreation and the National Park Service work collaboratively to maximize protection of the parks’ natural resources. 2018 marks the 50th anniversary of the national park, and National Parks at Night is working with the NPS to help celebrate the occasion with our Passport Series workshop, followed a few months later by the print exhibit of student and instructor work to be displayed at the park headquarters. One cannot help but be awed and overwhelmed by the enormity and majesty of these incredible trees. © 2017 Lance Keimig. During our workshop in June, we’ll experience a healthy sampling of all three environments the park offers—the forests, the prairies and the coast. Our base camp will be in the heart of the Yurok tribal lands, overlooking the mouth of the Klamath River in the tiny fishing village of Requa. Unlike most of our workshops, this one is inclusive of meals and lodging, which along with our classroom sessions will be at the historic Requa Inn. The inn is a special place, and we will have it, along with their talented chef, all to ourselves during the workshop. Meals will be specially prepared for us using local seafood and organic ingredients from a nearby farm. Though we won’t be running workshops at these parks in 2018, North Cascades and Katmai will also be celebrating notable anniversaries, so we wanted to include them in this dedication as well. North Cascades is one of the gems of our mountain parks, protecting a half-million acres of alpine wilderness in northern Washington. Though it doesn’t get as much fanfare as the state’s other two national parks (Olympic and Mount Rainier), it ranks just as high in terms of beauty and photographic opportunity. It’s a wonderful spot for both road warriors and backpackers, as it features about 55 miles of scenic byway and 400 miles of backcountry trails. This mountainous wonderland includes inspiring peaks, forested valleys, over 300 glaciers, and countless lakes, ponds and waterfalls. Mount Shuksan in North Cascades National Park sits reflected under a starry summer sky. © 2016 Chris Nicholson. North Cascades is organizing a slew of events to commemorate its golden anniversary, which they will begin announcing over the next couple of months. Be sure to check their website and Facebook page for more information as it’s available. Katmai National Park & Preserve in Alaska will be celebrating the biggest anniversary of the whole bunch: its centennial! Formed in 1918, the park protects some of the grandest landscapes in North America. Its features include scenery shaped by the devastating volcanic eruptions of 1912 (including the awesomely named Valley of Ten Thousand Smokes), the wilderness of 6,716-foot Mount Katmai, snow-covered peaks, pristine alpine landscapes and tundra, spruce and willow forests, hundreds of miles of coastline, hundreds of miles of rivers and streams, and hundreds of thousands of acres of lakes. Brown bears are the most famous attraction of Katmai. NPS photo by R. Taylor. Despite the 4.1 million acres of visual grandeur, that’s not even what Katmai is most famous for. The park’s major attraction is its most popular residents: the ubiquitous brown bears. If you’ve ever seen a photo of a brown bear fetching a salmon mid-air from the top of a waterfall, that image was probably created in Katmai, in particular at Brooks Falls. The bears are so frequent, numerous and predictable that people (especially photographers) flock to Katmai every July and September to see the beasts feast on the unfortunate sockeye salmon of the Brooks River. For the park’s centennial, Katmai is planning a series of events that will begin in April with a geology research symposium in Anchorage, followed by a summer full of webinars, culminating with an on-site event in September. More details will be announced on the park website over the winter. Additionally, the National Park Service recently created a website that celebrates the 50th anniversary of the National Trails System and the National Wild & Scenic Rivers System. For the next two years you can #FindYourWay to events and stories that will be exploring the 12,734 protected miles of rivers such as Allagash, Salmon, Snake, Missouri and Concord, to name a few. The Appalachian Trail, part of the National Trails System, wanders through some of the most spectacular scenery in the eastern U.S., including through Great Smoky Mountains National Park. © 2013 Chris Nicholson. Not a fan of water? Then get lost on one of the many scenic, historic or recreational trails that unite our country. Scenic trails include the big three—Appalachian, Continental Divide and Pacific Crest Trail—as well as eight others that extend well past 100 miles! There are 19 Historic Trails that bring you a richer sense of the history in their regions. A few examples are the ancient settlements of Hawaii, the gold rushers in California, the dog mushers of the Iditarod, and the adventures of the Lewis and Clark journeys, as well as the more somber Selma to Montgomery and Cherokee Trail of Tears. Still can’t find a path to follow? Over 1,000 trails in all 50 states are organized under the National Recreation Trail database. So no matter where you go, make 2018 the year that you go outside and explore more! Our Biscayne workshop runs from January 29 to February 3, our Redwood workshop from June 25 to 30, and the photo exhibit in both parks will be held in October 2018. We hope to see you there, seizing the night and celebrating the parks! Gabriel Biderman is a partner and workshop leader with National Parks at Night. He is a Brooklyn-based fine art and travel photographer, and author of Night Photography: From Snapshots to Great Shots (Peachpit, 2014). During the daytime hours you'll often find Gabe at one of many photo events around the world working for B&H Photo’s road marketing team. See his portfolio and workshop lineup at www.ruinism.com.